A group of teenagers crashed a stolen vehicle while on the run from police in San Jose Monday night. The incident comes in the midst of growing concern over a spike in juvenile crime in the Bay Area. Damian Trujillo reports. A group of teenagers crashed a stolen vehicle while on the run from police in San Jose Monday night. The incident comes in the midst of growing concern over a spike in juvenile crime in the Bay Area. A 13-year-old was behind the wheel of the stolen car which came to a stop in front of the Bridges Academy Charter School, along with three passengers all 16 years old or younger. 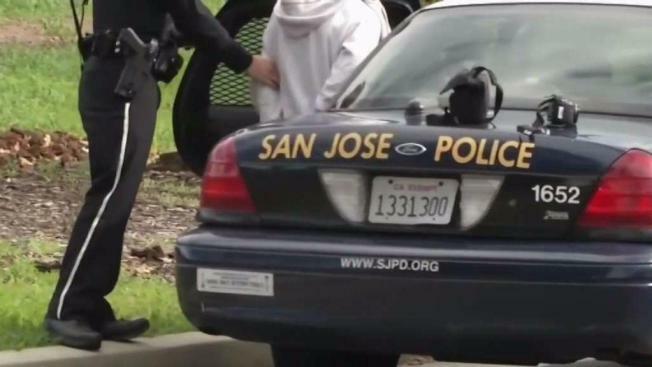 "I'd like to say 'yeah it’s shocking,' but right now it’s becoming more and more prevalent," said San Jose Police Officer Christan Camarillo, who recognizes the criminal justice system is too lenient on kids. Last year, police arrested an 11-year-old believed to be the getaway driver of a stolen car in a burglary and robbery spree. The District Attorney says juvenile crime increased countywide last year, especially residential burglaries, carjackings and auto thefts. "All our kids need options to prevent them from making bad mistakes," said Mario Maciel, director of San Jose Mayor’s Gang Prevention Task Force. The Task Force knows it’s going to have its hands full this summer, with kids looking for things to do. The city is once again hosting a summer jobs program to supplement its summer camp programs in the hopes of keeping kids from ending up in handcuffs. "It’s giving kids in our most marginalized communities the ability to stay busy this summer, building a resume, and not a rap sheet," Maciel said. More than half the youth arrested for a violent crime last year, had previously been arrested for other crimes, but serve little-to-no time for those crimes.